With this HumanaNatura salad meal, we are beginning a new series on natural but very-low carbohydrate or ketogenic (ketone-producing) eating. As you may know, ketogenic diets are increasingly popular today, but also controversial, since their long-term effects are not well-studied. However, ketosis is a natural process and, uncontroversially, ketogenic eating has at least one reliable and quite useful benefit. This is its crucial dampening of hunger and food cravings – via lowered sugar and insulin, elevated energy-rich ketones, and the increased dietary oils and fats that are a normal part of ketogenic nutrition. In practice, this natural reduction in hunger can greatly aid, though of course does not guarantee, healthier food choices and more optimal meal frequency and size. But returning to current controversies surrounding ketogenic nutrition, we want to emphasize that many approaches to ketogenic eating today do, in fact, appear broadly unhealthy – especially by being inadequately green and deemphasizing whole natural foods. In our new series, we will help you to naturalize and thereby optimize ketogenic eating – demonstrating how it can be done the HumanaNatura way and following HumanaNatura’s OurPlate healthy eating guidelines, each in a very-low carbohydrate format. Check out our first meal, and be sure to subscribe to follow the new series and our other informative natural health posts! This extra low-carb HumanaNatura meal begins with a piece of salmon, seasoned with Cajun spices and black pepper, which is pan-steamed on a small bed of diced shallot and garlic, with enough shredded cabbage to hold the fish above the water (see our Cooking With Steam Overview if you are new to food steaming). 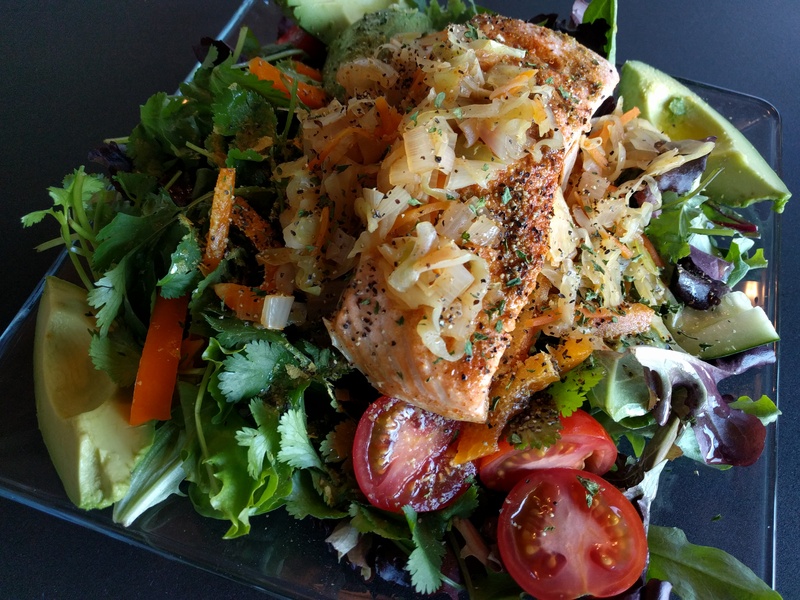 As the salmon fillet cooks, a raw salad is prepared with mixed greens, a handful of chopped cilantro, slices of avocado, a small amount of sliced tomato and cucumber, a few pieces of brie cheese, and a dressing of olive oil and balsamic vinegar. When the fish is done, it is allowed to cool for a moment or two, and then added to the salad, along with the cooked veggies, as shown. Finally, the entire meal is garnished with black pepper, parsley flakes, and a bit of nutritional yeast, and then served promptly. Overall, a meal that is fast and easy to make, delicious, low in sugars but not fiber, and rich in essential minerals and vitamins, with enough healthy fats and proteins to keep our hunger at bay for several hours, or even longer (if you want a higher carbohydrate and non-ketogenic variation of this meal, options include adding a bit of diced sweet potato to the steaming base and/or including a scattering of berries on top of the salad). This entry was posted on May 9, 2018, 10:37 and is filed under Natural Eating. You can follow any responses to this entry through RSS 2.0. You can leave a response, or trackback from your own site.